Last week was pretty eventful in terms of central banking. Obviously, the folk from the ECB grabbed a lot of headlines with their relative optimism but they are not the only ones trying to “whisper the reality”. Meanwhile, two important emerging markets central banks decided to cut rates last week. And dramatically so. First, the National Bank of Poland decided to reconcile the market split between a 25bp cut and a no-change decision by… slashing rates by 50bp*. Two days later, the Banxico decided to do a similar thing, also exceeding the market expectations. Now how is that possible? Two central banks, which historically have been quite hawkish and have kept rates generally high have suddenly decided to get adventurous? It shows two things. Firstly, according to the NBP models, potential growth rate has declined to below 3% from close to 6% before the crisis. 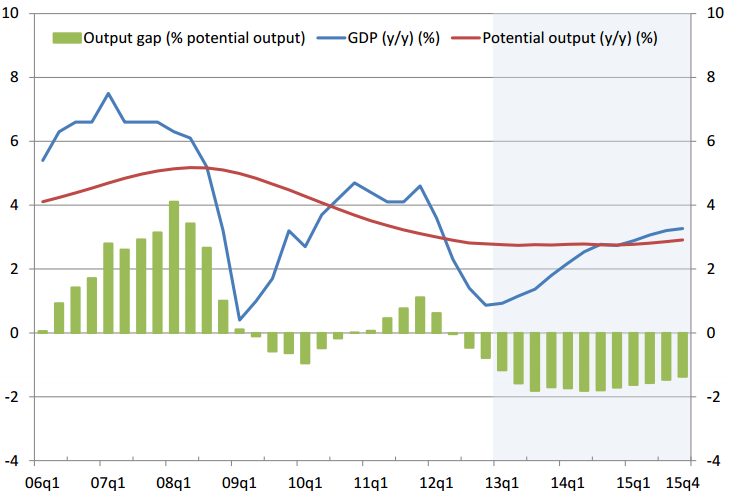 Secondly, the lost output is so huge that the central bank expects the output gap to remain wide open at least until the end of 2015. In theory, that means at least two more years of zero underlying inflation pressures (caveat: see the Intermission section that follows). This is bold. Intermission: Here I need to remind you of a significant distinction between potential output and potential growth rate. Have a look at the chart again – expected growth will exceed potential growth rate already at the beginning of 2015 (which by the way is pretty far off!). Only since then will the negative green bars start becoming smaller, reflecting the catching up with the lost potential. I don’t have a definitive answer to that but it is not entirely obvious that underlying inflation can start going up with green bars in the negative territory. the significant decline in inflation risk premium. Of course Banxico is trying to make a big success out of it by saying that it has fostered an environment with less economic uncertainty. And good for them but someone cynical could say that this simply means that the economy has lost a significant part of its potential growth rate. I am not questioning the decision itself – I actually think the Mexicans did the right thing – but wider ramifications of it could eventually lead to even lower rates than now. Same as in Poland. Now, Brazil is not in a crisis, despite the fact that GDP has been showing subpar growth over the last two years and is on its way to perhaps the third year of such a situation. Despite that, everything indicates that the Copom is preparing to raise the Selic rate, repeating the standard reaction of a past that everybody thought had been left behind. I can see where the Copom is coming from. Inflation remains of paramount importance in Brazil, to the point that they publish data to second decimals, as if it had any macroeconomic implications. I am not sure whether hiking rates will be the correct decision but I wanted to point out what can happen to an emerging economy if potential growth rates decline. If the economy has been showing “subpar growth over the last two years” and inflation is surging then maybe it wasn’t “subpar growth” after all? There are of course positive examples, too. Turkey is one of them (although not very recently). I have not been in agreement with their recent policies and I think they’re throwing their undisputed success in fighting inflation to the wind but if we go a bit further back, we will see at least two episodes of a durable decline in the inflation rate. Both occurred after periods of significant economic hardship – first at the beginning of the millennium and then after the 2006 crisis. Now, Turkey had a grand opportunity to durably lower inflation after the 2008/09 global crisis but the central bank instead decided to focus on micromanaging pretty much every element of the economy. The reason I mention that is all three episodes of a shock to let’s call it “normal” level of inflation were used by the central bank to slash rates dramatically. In this respect, the CBRT recognised that the economy has become less inflationary. However, it remains to be seen whether its most recent response to global events is correct. In other words, the risk the CBRT is running is that it assumes that potential growth rates is higher than it actually is. It worked in the first two instances but that may be because they were driven by local developments (rather than the global crisis like in 2008/09). If the CBRT is not lucky this time, events could necessitate a similar approach to the Copom. How to trade this? There seem to have been two approaches to monetary policies in recent years in emerging markets. On the one hand, we have seen activist central banks such as BCB or CBRT which have actively engaged in currency wars etc. They seem to be operating under the assumption that they need to counter whatever it is that Fed/ECB/BoJ conjure. I would call that “externally driven monetary policy”. On the other side of the spectrum you have the likes of Poland or Mexico, which – while acknowledging the impact of external developments – have maintained their reaction functions roughly unchanged. The latter group is beginning to realise that their economies are developing considerably slower than they could and so chances are that last week’s rate decisions are not the last surprises they have for us. As such money market curves should steepen there. The former group is to some extent the opposite. They are either like Brazil coming to the conclusion that inflation is becoming an issue despite slow growth. Or, like Turkey, they keep playing with fire pretending that the economy is still not strong enough to push inflation higher. One should be very careful being long duration in those, in my opinion. * Despite huge temptation, I will not dwell on how ridiculous the communications policy of the Poles is. After two months of becoming increasingly more hawkish and suggesting a pause, they decided to cut more than expected to show that they’re done. I did not lose money on that so it’s not my grief speaking but I really believe this is the worst Monetary Policy Council among the mainstream emerging countries.